This picture kind of sums up why I started blogging. Growing up in a rural area during the 80s, before the interwebs, it was tough to be a goth kid into stuff like the Cure, R.E.M., Husker Du, and that stuff (remember, this is before Nirvana got all over MTV and changed everything—and certainly before you could just download songs to a phone—I mean I had to go to an actual store and try to buy often-unavailable CDs—the horror, the horror). Most of the time I thought no one felt like I did, or had similar thoughts, or anything! I realize most teens feel that, even today, but the internet makes it so much easier to find the like-minded. It does not matter how stupid, silly, weird, or possibly embarrassing a secret thought might be, at least one other person with the same thought can be found via the internet. Just like this silly picture above. 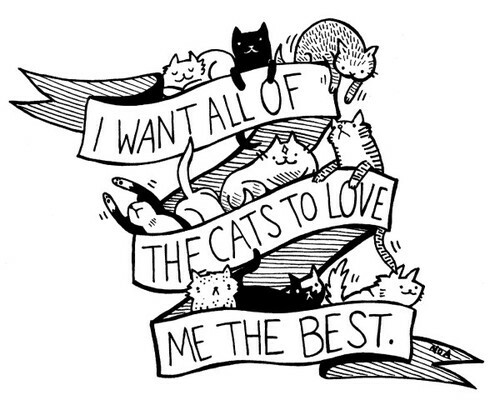 I am a crazy-cat-lady-in-training, (possibly also a crazy-dog-lady too), and yes, the thought “I want all the cats to like me best” crossed my mind ages ago. And whaddya know, someone else had the same thought! So, as I progressed in my cancer treatment, I began to feel more and more discontent with the “save the ta-tas” style of advice or conversations available to me in real life. Eventually, I found a support group comprised of women who shared some of my discontent. But it was hard to get started in the group….I was too sick and tired with treatment and work to attend much at first. My guess is there are others with a similar outlook who might be relieved to see that someone else in the world thinks the same thoughts. I know I wish I’d found some blogs I now read a bit earlier, it would have saved me some angst! So this blog is for you, fellow cancer malcontent, where ever you are! Thank you! Your blog is for me, your fellow cancer malcontent, as mine is for you! I am so glad you found a group. The right group of people can really help. I formed life friendships and my group still meets once a month at each other’s homes now that most are way past treatment. This cancer world isn’t easy. Ha ha, yep, we’re small in number, but we are together.